All things eye | Por Yong Ming: Can spectacle power return after LASIK? Can spectacle power return after LASIK? LASIK changes the power of the eye by changing the shape of the cornea, the clear window at the front of the eye. Besides transmitting light, this window is also responsible for much of the focusing power of the eye, giving doctors a great opportunity to 'build a contact lens' into the eye itself. LASIK works by removing minute amounts of corneal tissue from the surface of the eye. By doing so, certain parts of the cornea can be flattened, and other parts steepened. For example, in shortsighted patients the central part of the cornea is flattened, the amount of flattening corresponding to the spectacle power of the patient. The higher the spectacle power of the eye to begin with, the more likely this is to happen. However, overall the risk is low as has been shown in a number of studies. The above graph from an article in the American Journal of Ophthalmology shows that even after 10 years, the average spectacle power of the eyes of a group of patients was only about 50 degrees, or 0.50 dioptre of shortsightedness. If the spectacle power returns, what next? It depends on how much power has come back, how much cornea is left, and how keen the patient is on having a LASIK enhancement/adjustment. Generally speaking, an enhancement is not recommended if the residual spectacle power is 50 degrees or less than targeted. Some patients are also quite happy if the power is higher than that, and there is no need to repeat surgery for all these patients. When the power gets to 75 degrees or higher though, more and more people find that it affects their daily activities. They may need glasses, for example, when driving. If so, the inconvenience may drive them to seek an enhancement. This can be considered if the remaining cornea is thick enough. In recent times it has been found that a LASIK flap can be lifted again many years after the original surgery. As such, an enhancement surgery is very much 'half an original LASIK operation', since it does not involve making another flap. Using topography guided techniques, enhancements can be done not only to correct residual short/long sightedness and astigmatism, but also aberrations like spherical aberration and coma. The picture below shows topographies (corneal maps) of a patient who had coma and residual shortsightedness before (left most map) and the subsequent healing after enhancement. Note how the blue area has shifted from the right side (left map), over to the centre (right map). If the cornea under a LASIK flap is already too thin for further treatments, alternative techniques would include PRK on the flap, or even ICL surgery if the anterior chamber of the eye is deep enough. very very helpful post. I like this & i do appreciate about this blog and this post. Hi, I have just emailed you. However, essentially you need to see an ophthalmologist, get some tests done and find out exactly what the problem is with your eyes. From there, we can decide on the next course of action. Thanks very much for reading this blog! Nice informative blog. 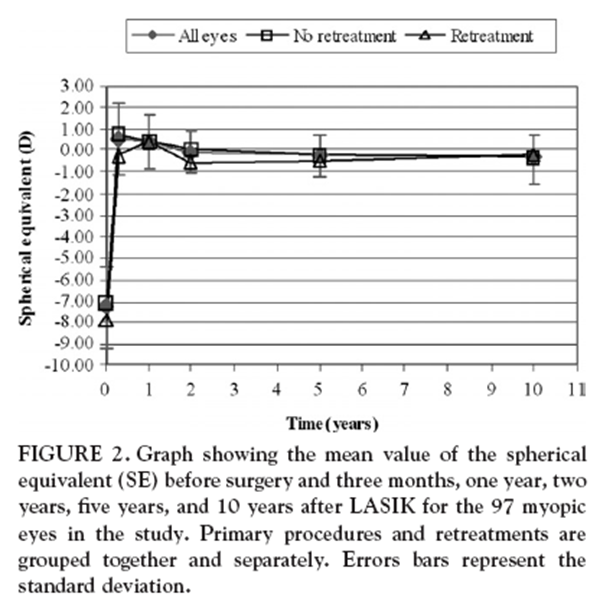 I am from India I had lasik in 2011(age 23) and Doctor said you wont need specs until age 40, first 5 years all went well but after that my eye site start getting weaker and currently my number is -0.5 left eye and -0.25 right eye. Is enhancement recommended?